Are you ready to begin your path toward teaching yoga? Are you an experienced teacher looking to expand your knowledge and skills? You’re in luck. The 8th smallest state in the country is full of opportunity! Baltimore Hot Yoga & Wellness: 200-Hour Teacher Training starts in just a few weeks! 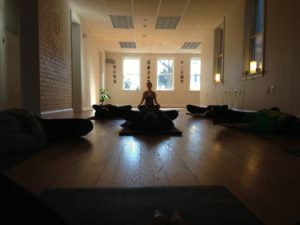 Baltimore Yoga Village: 200-Hour and 300-Hour Trainings, plus various Specialty Trainings and continuing education workshops. Greater Baltimore Yoga: 200-Hour and 300-Hour one-on-one training in traditional apprentice style. The Yoga Center of Columbia: 200-Hour and 300-Hour Trainings begin in 2019. Ayurveda Immersion and Advanced Yoga Skills Training also available. Yoga on York: 200-Hour, 300-Hour, and 500-Hour Trainings. A variety of Specialty Trainings are also available (aerial, tots to teens, and various CEU workshops). YogaTree: The Art & Technique of Teaching Yoga 200-Hour Program begins in January 2019. M.Power: 200-Hour Power Vinyasa Teacher Training kicks in March 2019. Down Dog: Fall/Winter 2018 200-Hour Program, Teacher Training Retreat to Mexico in February, and 300-Hour Training starting in early 2019. Numi Yoga: 200-Hour Teacher Training begins in September. Opus Yoga: 200-Hour Immersion & Teacher Training starts in September. Spiritual Essence Yoga: Jivana Yoga Teacher Training (Levels 1-3), Usui Reiki Certifications, and Thai Yoga Massage Certifications. The Mindfulness Center: offers 200-Hour Yoga Teacher Training, as well as on-site and online Meditation Teacher Trainings. The Spring Yoga & Natural Health Care: 200-Hour, Aerial, and Yin Yoga Teacher Trainings. Thrive Yoga: 200-Hour and 300 Hour Trainings, as well as various Specialty Trainings and CEU workshops. Evolve Yoga: 200-Hour and 300-Hour Teacher Trainings. Several Specialty Trainings are also available. Jala Yoga: This nearby WV studio offers 200-Hour, 300-Hour, and Aerial Yoga Teacher Trainings.